There is a popular habit among the secular-liberal gang in India. They claim that 69% of people had never voted BJP and thereby, the legitimacy of the government is questionable. However, they fail to understand that last two governments were led by a party with less than 30% of vote share. In the ‘Sanjhi Virasat Bachao’ (save composite culture) convention in Jaipur, Sharad Yadav of JDU had said the following: They (the BJP) don’t want a Congress-free India. They want an Opposition free India. That will never happen. They should not forget that gained power with just 31% votes. It means 69% people voted against them. Again, the then JNUSU president Kanhaiya Kumar had said that 69% of people had voted against Modi while speaking to an audience. He had said: I want to remind our government that 69% voted against you. Just 31% voted for you and some of them were caught up in your jumlas. It is generally claimed that BJP and Narendra Modi don’t have the right to run a full majority government as they have secured merely 31% of vote share in 2014 Lok Sabha polls. However, the reality is that no single party had secured more than 30% vote share of the public since 1991 (when Congress had 244 seats with 36.1% of votes). Sonia Gandhi took over the Congress party in April 1998. The Lok Sabha polls were concluded by February 1998. Thus the performance of Sonia Gandhi can be tracked from 1999 Lok Sabha poll onwards. Thus one could have very well questioned the legitimacy of 2004 and 2009 governments formed under the leadership of Congress party and Sonia Gandhi. The same can be said for the first Congress government led by Jawaharlal Nehru as well. 55% percent of the electorate had voted against Nehru. 1 out of 2 persons in India did not want Jawaharlal Nehru as prime minister in the first general election. 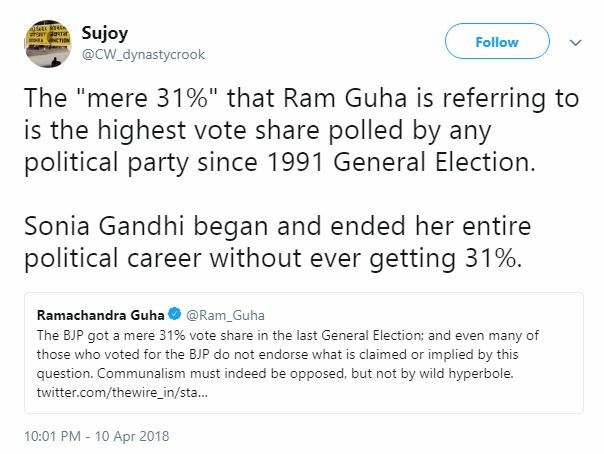 In fact, Congress under Nehru never crossed the 50% vote share in first three general elections. That doesn’t make him an illegitimate Prime Minister. Therefore this 31% jibe is nothing but a juvenile argument. It is quite difficult for any party to get a full majority in a diverse multi-party election with intense competition. Therefore it is better if the opposition sets aside the 31% mentality and work on setting its house in order. In addition to this, Sonia Gandhi must introspect why Congress never got a vote share above 30% in general elections under her leadership.